Heritage Days celebrates the history and culture of Mayo Clinic through a wide range of creative projects during the year. These celebrations culminate in a dedicated week of events every October. This year's event will be held Oct. 1–5. Mark your calendar and bookmark the Heritage Days intranet sitefor the following activities. Film: "Where Healing Begins —The Mayo Clinic Experience"
Mayo Clinic has long been known for its unique environment of healing that includes art, architecture, efficient systems, and a compassionate, team-based culture of service. A 35-minute original documentary film provides a behind-the-scenes look at the thought, engineering and focus on the patient that combine to create Mayo's distinctive character. This film is made possible with generous support from John T. and Lillian G. Mathews, and Steven E. Brown and Anne M. Huber. It will be shown multiple times throughout the week of Heritage Days, Oct. 1–5. The film also will be posted to Video Exchange and the Mayo Clinic History & Heritage website. Take a break and enjoy a treat with your friends and colleagues on Oct. 4. As an expression of gratitude to staff for upholding the primary value of "the needs of the patient come first," the Employee Appreciation Ice Cream Social is one of the largest and most inclusive events at Mayo Clinic. Ice cream is distributed to more than 100 Mayo locations in five states, three time zones and several work shifts. 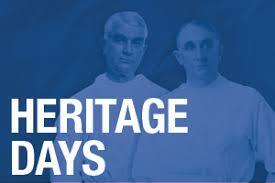 The Heritage Classic has been a Heritage Days tradition since 2012. In 2018, the event will take place on Sept. 22. For the first time, the Heritage Classic will expand to Mayo Clinic's Florida campus and Mayo Clinic's Arizona campus. The event is open to staff, volunteers and families, and promotes well-being for all fitness levels. The event also supports the needs of patients through the Mayo Clinic Hope Fund, which provides financial assistance for meals and other costs associated with receiving care at Mayo Clinic. Look for complimentary notecard sets at various Heritage Days events as well as at information desks and other locations across Mayo Clinic. The cards feature colorful photos that depict what William J. Mayo, M.D., called "the spirit of the Clinic." Be on the lookout for life-size cutouts of photos of leaders from Mayo Clinic's past. They will appear at a wide range of Mayo events and are a great opportunity for selfies. Many locations also are developing local Heritage Days events. In Rochester, there will be an organ concert at the chapel at Mayo Clinic Hospital — Rochester, Saint Marys Campus, on Sept. 30; a carillon concert on Oct. 1; a "Meet the Falcon" event on Oct. 1; and an exhibit of classic vehicles on Annenberg Plaza Oct. 1–5.